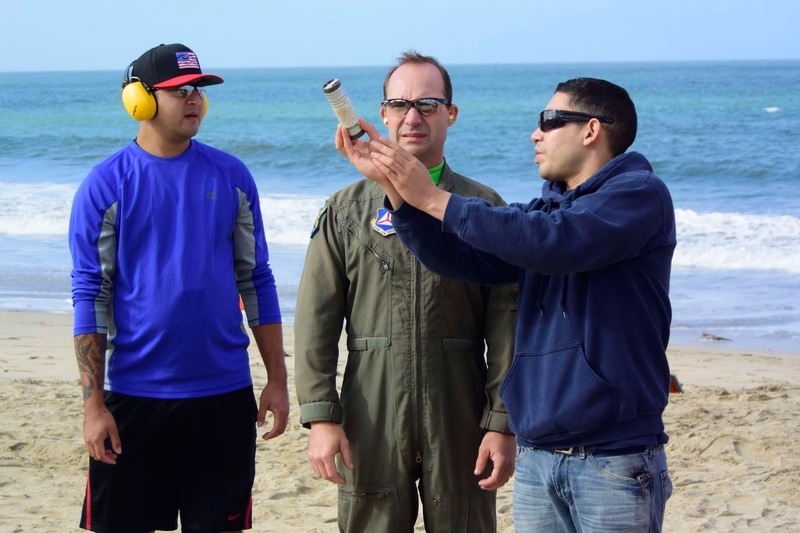 Earlier in September, several members of Squadron 188 - and other squadrons - participated in the US Coast Guard’s (USCG) Water Survival Training course. Thanks to 1st Lt Al Chavez and Capt Jordan Hayes for organizing this training and to the USCG for allowing us to participate. Every CAP crew member who is part of an extended overwater flight must be current in Water Survival (WS) certification. Although most of our Wing’s sorties are not extended overwater flights, such flights are not as extreme as one might think: Other than the take-off or landing phase, an extended overwater flight is defined as any flight operation, sortie or event, conducted outside the normal power-off gliding distance of land, as determined by altitude, distance, glide speed, wind and other determining factors. One does not have to be far out over the ocean for this: Crossing the Bay or the Monterrey Bay or other nearby bodies of water at a low enough altitude can easily put one of our aircraft into an extended overwater flight. On September 3, Squadron 188 members Maj Noel Luneau, Capt Hayes, Lt Chavez, 1st Lt Eric Choate, 1st Lt Gabriel Fletcher-Hernandez, 1st Lt John Stevulak, and Lt Hollerbach met up with the USCG instructors and trainees at Dunes State Beach in Half Moon Bay for a little swim… and some serious training. 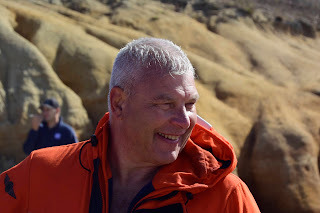 The day was unbelievably fun: After a safety orientation, we divided up into groups of 5 that would swim out to a life raft anchored offshore and practice our open water skills, one group at a time. 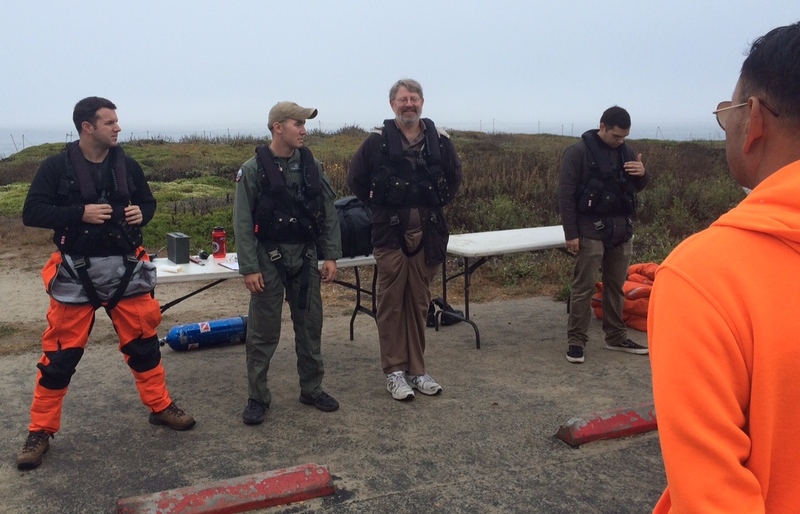 In the swim, some of us got to try out the Coast Guard-provided anti-exposure suits and/or other full body clothing to help us simulate swimming in flight suits, as we would need to if we found ourselves in the water after ditching. 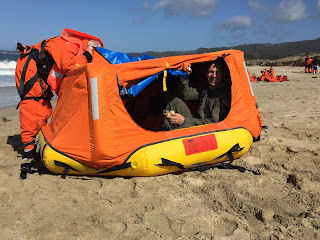 Besides swimming on our own and in a group float technique, we got in/out of the life raft and inventoried our survival equipment. 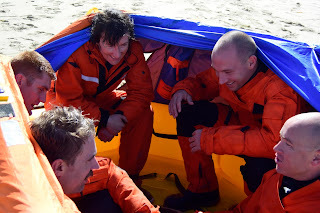 Besides the ocean portion, we had additional training on the beach, practicing using pyrotechnics safely, building fires and survival shelter, using pumps such as the kind the USCG would provide to survivors in life rafts during a rescue, and other techniques. 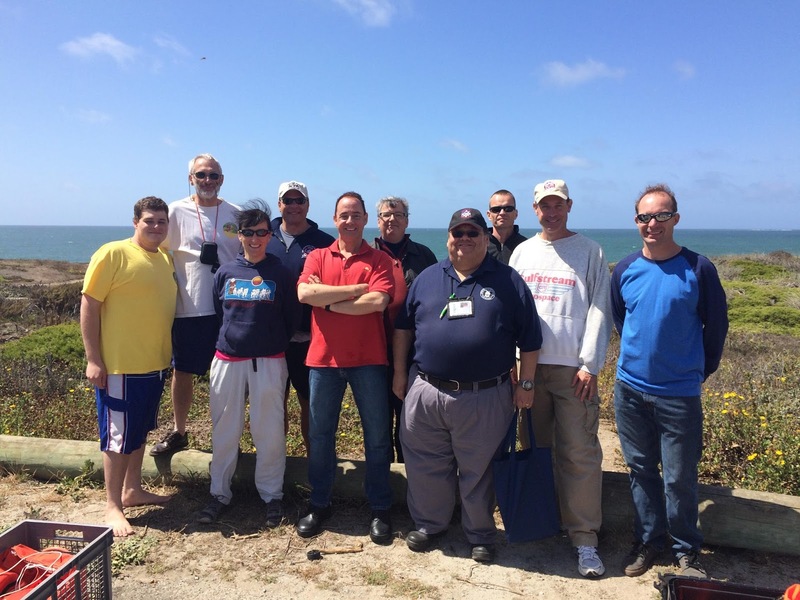 Most of us were in teams of 1 CAP member per 4 USCG members. Each team rotated through each of the swim and on-land learning stations. We were very lucky with the water temperature, which was a balmy 68 deg F. My wet suit plus exposure suit was way too warm - at least relative to what you might expect in the Pacific Ocean off of Northern California! 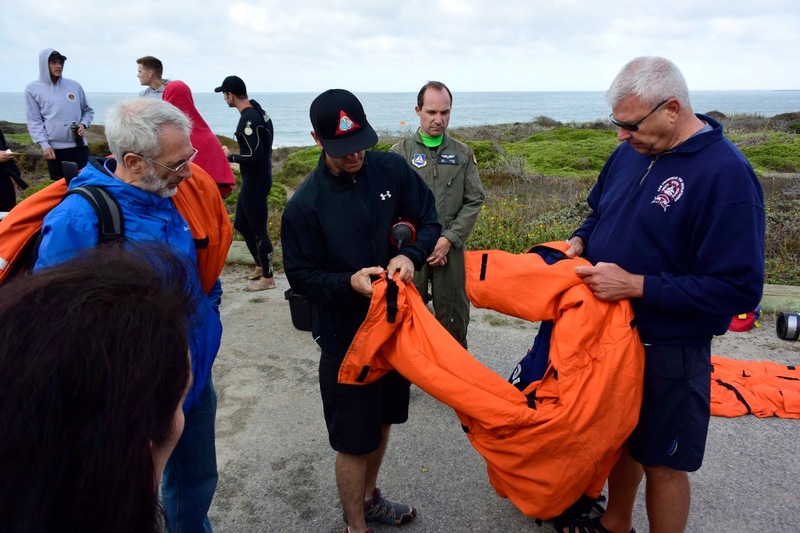 Worse yet, the combination was much too buoyant for me, especially when paired with even a partially inflated PFD/personal flotation device (which, as my USCG team members explained to me, was one size fits all, to include enough buoyancy for the 200-300 lb men in their ranks). Even letting almost all the air out of my PFD, I could not duck under the waves to swim beyond the surf. Since I love to swim in the ocean and play in the surf, it was both frustrating and funny. Like a little piece of cork, each time I tried to dive underneath a wave, I popped right back up, was inhaled by the breaking wave, and ended up being flung closer to shore than I’d started. Two of my USCG teammates ended up pushing me underwater in each wave, until we got past the surf zone. I was never so grateful to be held UNDER water in the ocean by two men much larger than myself. Really, they were being helpful, not trying to drown me! 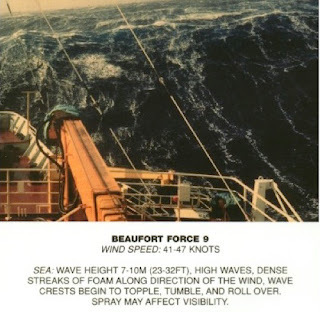 Several of us played in the surf before it was our turn to swim out to the life raft offshore. 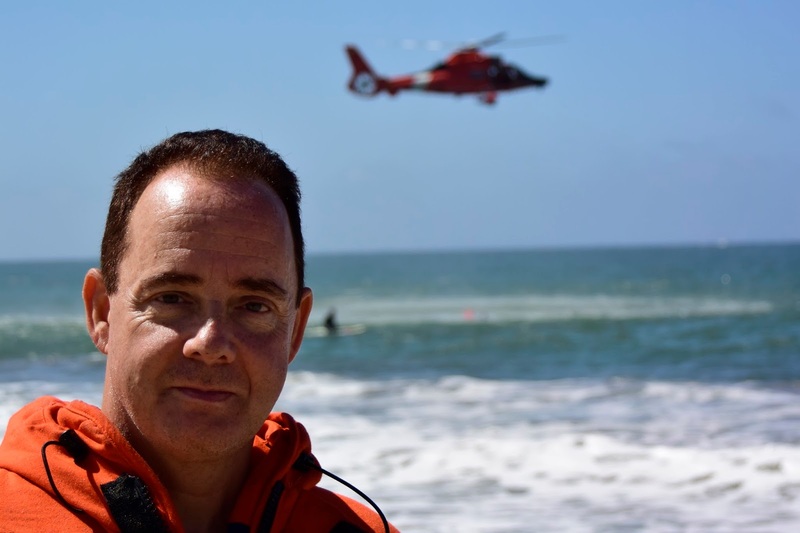 Lt Fletcher-Hernandez's video shows us in the surf zone, with me being pummeled by a wave. I like how he neatly stops the recording before one can see that I did survive. The waves picked up later in the afternoon, and the last team, consisting of all CAP members, had to work a lot harder swimming out to the life raft. To keep everyone safe, the USCG instructors brought the raft in a little closer to shore. Just the same, they spent every bit as much time in the water as everyone else was required to do, in order to pass the class. Recently, we had a discussion about professionalism and what it means to CAP, so it was still on my mind during this training, and I was very happy (but not surprised) to see that both the USCG instructors and the trainees demonstrated exemplary professional behavior throughout the day. It was a great pleasure to train with them. CAP can be grateful for the opportunity to learn from and together with them. An especially big thank you goes out to our host, AST1 Aviation Survival Technician Petty Officer 1st Class Jonathan Kline, Rescue Swimmer U.S.C.G, as well as the other outstanding instructors from the Air Station San Francisco: ASTC Moyer, AST2 Hanchette, AST3 Munns, AST3 Bell, and AST3 Santoyo, not to mention ASSF Chief's Mess for the delicious barbecue. Know your limitations. 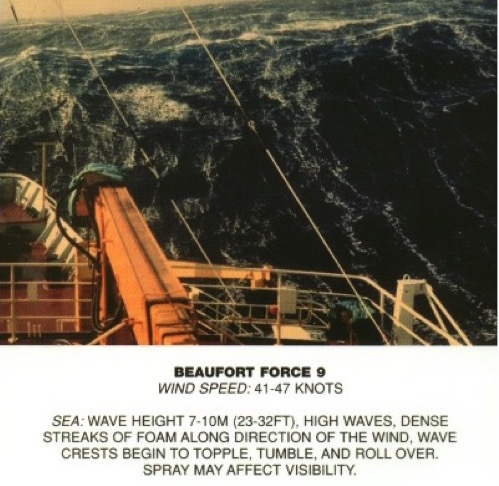 If you had to ditch when the waves are a 9 on the Beaufort Scale, would you survive? Perhaps better to stay home safely. At the end of class, we took turns practicing timed egress from the airplane, in crews of 3, including remembering to exit with a simulated raft, which required some additional crew coordination that most of us are not used to when thinking about emergency egress on land. Not so easy to do in just a few seconds - although everyone was able to do it and meet at the tail of the aircraft in well under the required maximum 60 seconds. If you haven’t taken this training yet, I highly recommend it. 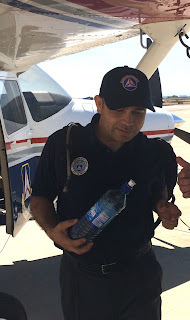 It might save your life some day, or enable you to save someone else’s by participating in a mission that you would otherwise not be able to participate in. In the meantime, the training itself is a lot of fun. An alternate water date is set for September 17, so it's not too late. ... September 18 addendum: Congratulations to SM Kenneth Sturgill and 2d Lt Michael Gross for completing their water portion on September 17. 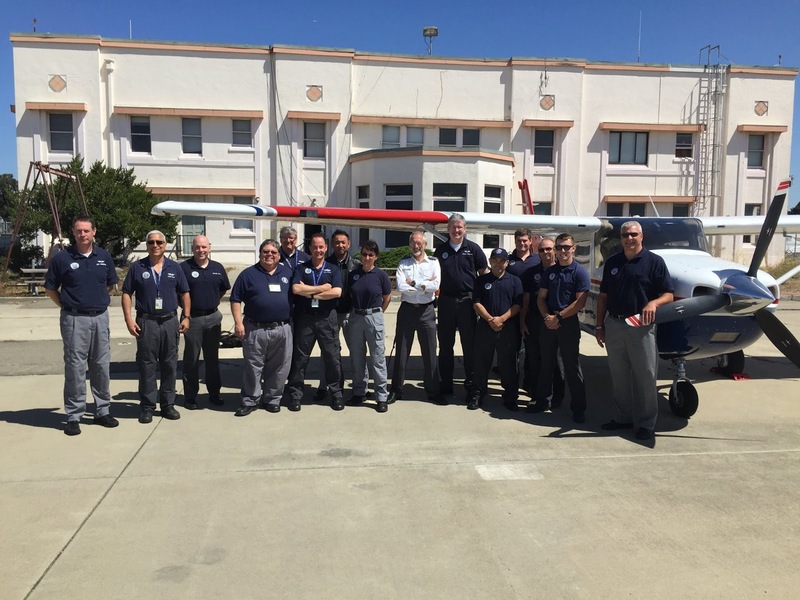 Civil Air Patrol Joins Total Force "Airmen"